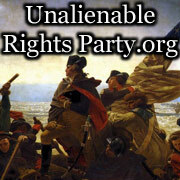 It is our Unalienable Right as Citizens to Alter our government. We the Citizens of the United States hereby Alter our government by our vote. We the Citizens of the United States Petition and Vote to ban the use of any Genetically Spliced Organisms (AKA GMOs) in food products. 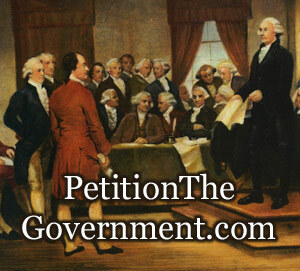 We the Citizens of the United States Petition and Vote to Repeal ObamaCare, Defund ObamaCare, and Declare ObamaCare Unconstitutional (The Patient Protection and Affordable Care Act). Individual Freedom and Liberty are best served through Free Market Principles and Local Governance. We the Citizens of the United States Petition and Vote to Replace ObamaCare with free market solutions which should include health savings accounts, insurance portability, insurance available across State lines, high deductible insurance, direct payment from patients to their healthcare providers, catastrophic healthcare insurance, charitable healthcare provided directly by healthcare providers and charity healthcare provided through charitable organizations. We the Citizens of the United States Petition and Vote to Repeal the 17th amendment to the U.S. Constitution so that the U.S. Senate, once again, represents the States and acts as a check on our out of control Federal Government as the Founding Fathers originally intended. We the Citizens of the United States Petition and Vote to Declare American English to be the Official Language of the United States and require that all government signs, documents, ballots, and answering machines used in the United States are only in American English. We the Citizens of the United States Petition and Vote to Declare deficit spending unconstitutional because a national debt is "Taxation without Representation" on the unborn Citizens of future generations and we establish a rainy day fund to be funded in good times and accessed in bad times. The Congress may, by a two thirds vote of both houses, suspend this Alteration for a one year period in times of Declared War or Negative Gross Domestic Product growth. We the Citizens of the United States Petition and Vote to Abolish sovereign immunity for government employees, government appointees, and elected government officials and require them to take the following oath. "I do solemnly swear (or affirm) that I will tell the truth and I will not willfully deceive or blatantly lie to the Citizens of the United States concerning matters material to my official capacity under penalty of perjury, penalty of suborning perjury, removal from my position, loss of my benefits, and loss of any right to hold a government position upon conviction." An exemption will be made in matters of National Security. We the Citizens of the United States Petition and Vote to Mandate, authorize, and fund the deployment of our U.S. Military to protect, defend, and secure our border areas and to construct a Southern border fence to protect us from foreign invaders, enemy combatants, terrorists, gangs, illegal aliens, and drug cartels for a period of three years with the provision that this authorization will be extended or reinstated for one year periods until the Southern border fence is completed and the threats to our border areas are neutralized. We the Citizens of the United States Petition and Vote to Appoint and fund an Independent Special Prosecutor to investigate the Fast and Furious Scandal and any resulting violations of law. We the Citizens of the United States Petition and Vote to Declare a moratorium on all immigration for a period of three years with the provision that it will be extended or reinstated for periods of one year whenever our unemployment rate is above five percent or the borders of the United States are not secure. We the Citizens of the United States Petition and Vote to Abolish the U.S. Department of Education and return the responsibility of education to State authority, local authority, and Parental authority per the Unalienable Rights of the Citizens and the Tenth Amendment. 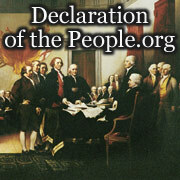 We the Citizens of the United States Petition and Vote to Alter Article V of the U.S. Constitution by designating the original paragraph of Article V as Section.1. and adding Section. 2. "The States, whenever two thirds of the State Legislatures shall deem it necessary, shall propose an Amendment to this Constitution, which shall be valid to all Intents and Purposes, as Part of this Constitution, when ratified by the Legislatures of three fourths of the several States." We the Citizens of the United States Petition and Vote to Appoint and Fund an Independent Special Prosecutor to investigate the 9-11-2012 Benghazi Attack and any resulting violations of law. We the Citizens of the United States Petition and Vote to Reinstate the 1933 Glass-Steagle Act so that banks are more stable. Our Citizens have been divided into a multitude of opposing groups and our government seems to have forgotten that it is our servant, and not our master. Our government of, by, and for the Citizens has lost its way and has become more a government of the politicians, by the bureaucrats, and for lobbyists, unions, campaign contributors, drug companies, foreign banks, large corporations, small vocal minorities, the Federal Reserve, the United Nations and the New World Order. The Alterations under this Interactive Declaration of the Citizens, once ratified by a majority of the voting Citizen electorate, will be valid for all intents and purposes as an integral part of our government. Thereafter our government will make no proclamation, law, or ruling which contradicts or diminishes the enactment and implementation of a ratified Alteration. This Interactive Declaration of the Citizens will never be used to infringe upon our Bill of Rights for Citizens of the United States. We trust and believe in the Wisdom of the Citizens. In order to sign alterations, you must login or register.